Welcome to SAE SAE Hostel! Your next home away from home. We are located centrally in the city of Yogyakarta or “Jogja,” considered the cultural center of Java. 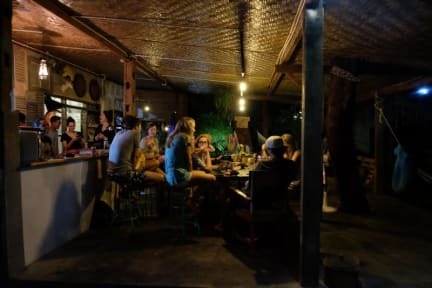 Down a small alley, away from the hustle and bustle of the city, SAE SAE is just a short walk from the Sultan’s Palace and the Prawirotaman tourist area where you can find lots of local warungs/food stalls and restaurants with international fare. We are a smaller hostel, priding ourselves on the warm, family-like atmosphere that helps guests to feel instantly at home. We offer four double rooms with fans and two-spacious dormitories with air-con. Our bathrooms are shared, with hot showers and an endless supply of toilet paper! We also have a fully-equipped common kitchen where guests are free to cook their own meals. In addition, free coffee, tea, and drinking water are always available. While SAE SAE is fully equipped to ensure guests a comfortable place to rest, it is more than just a place to sleep. We here at SAE SAE are always ready and willing to share our inside tips and knowledge about what to see, do and eat in Yogyakarta and its surroundings. Our primary goal is to ensure that our guests will have a memorable and pleasant stay. We have a spacious common area in the middle of our green garden, where guests come together to unwind and share stories after being out and about all day. Our garden is a space where strangers become friends and the world becomes a little smaller as our network continues to expand with each guest that stops by. Looking fellow travelers in the eye like they are future friends; that’s what we are all about! We hope to see you at soon at SAE SAE so that we can share all that Jogja has to offer – delicious cheap food, tons of culture and art, and a community of individuals who truly embody the spirit of Yogya – kindness, humility, and pride in an amazing cultural heritage. 1. Check in at 2 pm. 2. Check out at 11 am. 6. Reception Hours: from 7.30 am to 11 pm. - Between 11 pm and 8 am, there is a night guard who can assist with check-in and arranging taxi. 10. Don't flush toilet paper. Small hostel, so you get to know everyone. Staff is very kind. Very relaxed atmosphere! Great experience! This trip has been my first time backpacking and Sae Sae was just such a welcoming and friendly place that it really took any trepidation about backpacking away. The staff are great! First time that I’ve given a perfect 10. Outdoor area is a great place to hang out and meet people. Staff was friendly and helpful. They even organized a barbecue for the guests while we were here. Next time I’m in Jogja, I will stay here for sure. Clean bedrooms and facilities, they provide a towel for you. Very good vibe around the hostel and cool aesthetics! It is close to the water palace and a park so good to go by foot instead of taxi. Tour organised to borobudur was awesome but I felt 150k each (6 people) for a driver was a bit steep. I would definitely recommend staying here! My only real complaint would be that the blanket provided on the bed was only half size so I had to use something else to keep me warm all over! Very well decorated, friendly staff, great breakfast options and always someone around to hang out with! From looking at all the high ratings for hostels in Yogyakarta I was skeptical they were really that good and yes. 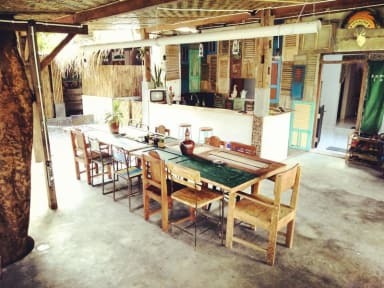 This hostel is really worth the high rating, the staff are incredibly helpful, friendly and know a lot about the area and cater their travel advice and what you want to do. Spent New Year's Eve here and it was a great vibe, it is really easy to meet people as well and it is really close by to good restaurants and the main square, strongly recommend! Had a great time at Sae Sae. The staff was super helpful with booking tours and giving suggestions for what to see around town. I forgot my belt at the hostel and they made a huge effort to get it to me in Bali, much appreciated. This extra customer service is why I would highly recommend Sae Sae to anyone going to Yogyakarta. Great place and great staff. Near city center. The blankets at the bed were a bit tiny for a fella like me. Had a great time. Would definitely stay at it again.